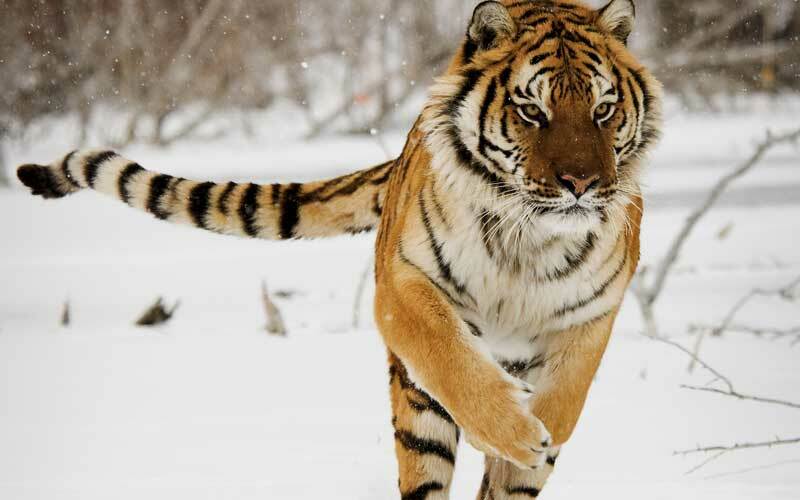 The Siberian tiger or Amur tiger is the largest subspecies and the largest cat in the world. However, this has only happened with specimens in captivity as in the wild the Bengal tiger is bigger. In ancient times it was widely spread, but nowadays its range is smaller. 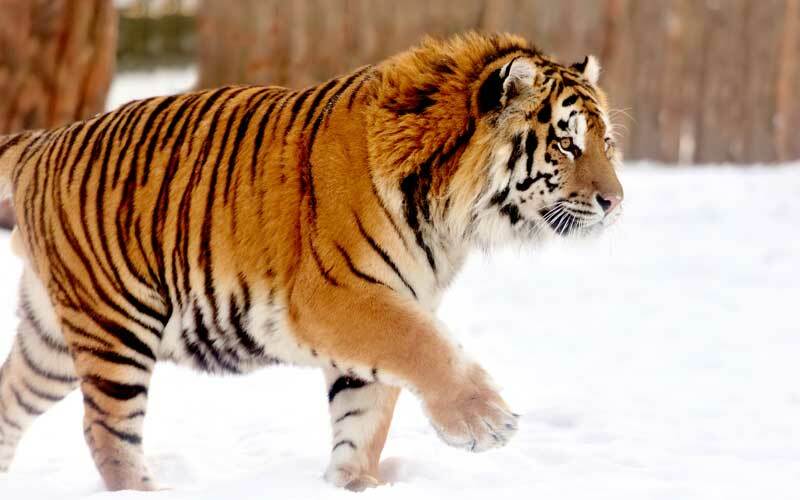 The Siberian tiger developed some physical adaptations to endure the cold climate of its habitat, like a thick layer of fat and a very dense fur, paler and with fewer dark stripes compared to other tigers. It has a yellow or reddish skin with dark, narrow and widely separated dark brown stripes. The chest, belly, inner limbs and the area around the neck are white. It has a flexible body and a long tail, which measures about 39 inches in males and about 36 inches in females. The Siberian Tiger Project reported that this species is between 70 and 82 inches in length, with males being larger than females. The former measure on average 68 inches in length, while the latter has an average length of 77 inches. The biggest specimen on record had a length of 138 inches. Historically, the average adult weight was 474 pounds for males and 300 pounds for females. In short, a Siberian tiger can weigh up to 660 pounds, but one specimen raised in captivity reached 1025 lbs. Siberian tiger – Panthera tigris altaica. This subspecies is mainly found in eastern Russia, although there is a small population in China that depends on the movement of animals crossing the border with Russia. It cannot be confirmed if they inhabit North Korean territory. They inhabit high latitudes in taiga and boreal forests. 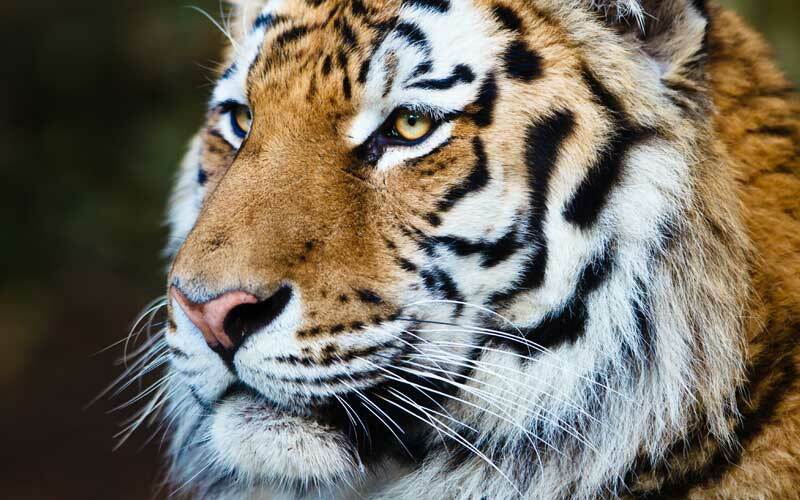 Most are circumscribed to two small areas of Russia, although their range of distribution is greater compared with other tigers, given the low density of prey. Therefore, they have to travel considerable distances to find food. Its range covers about 1,000 kilometers from south to north in the Russian Far East, including the territory of Primorye, south of the Amur River and in the Krai region of Khabarovsk. They mainly inhabit the area of ​​the Sikhote-Alin Mountains and the southwestern province of Primorye, although some prefer to dwell in the mountain system of East Manchuria. However, over 90 percent of Siberian tigers live in the mountain region of Sikhote-Alin. The Siberian tiger feeds on several animal species. An individual typically consumes Musk deer, Manchuria wapitis, Gorals, Moose, wild boars, Siberian roe deer, Sika deer, hares, rabbits, pikas and even salmon, and other species of ungulate animals. According to a study carried out in the 1990s, its distribution seems to be related to the distribution of its favorite prey. This powerful predator has to travel long distances in search of food, usually at night. Its striped fur allows it to camouflage with the environment, to sneak up on his prey and attack surprisingly from behind or the side, in a quick jump and delivering a knocking blow or a lethal neck bite. It is a solitary and very territorial tiger, which usually marks trees and rocks to establish its area. Although there are only a few hundred Siberian tigers in their distribution range, they have the advantage of having vast areas available for searching food, an activity to which they dedicate part of the night. This animal is well-known for its power and strength, which added to a fearsome reputation, stir fear among humans. However, the Siberian tiger avoids contact with people, although it may conflict with them if they are sick, injured or unable to hunt normally. 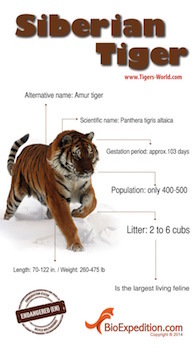 Characteristics of the Siberian tiger. Siberian tigers can mate at any time of the year as long as they have reached sexual maturity, which occurs around four years of age. Females leave marks of smell and scratches in the trees to let males know they are receptive. Mating occurs during the 5 or 6 days that both sexes are together. Subsequently, males leave females, and they do not return so that the care of the offspring always rely on the mother. Once pregnant, tigresses expect between 3 and 3.5 months for the birth of the cubs, which are usually 2 to 4 per delivery, although there are cases of litters with 6. The offspring spend a lot of time playing and feeding until they are 18 months old when they start hunting. However, they separate from their mother until they are 2 or 3 years old. The IUCN has classified the Siberian Tiger as Endangered. Unfortunately, the Siberian tiger has faced difficult times, full of threats derived mainly from human activities. The International Union for Conservation of Nature (IUCN) has classified the Siberian Tiger as Endangered, but in the 1990s it was Critically Endangered. One of its worst times was in the early twentieth century since in the 1930’s the population fell to about 20-30 individuals. A 2005 census estimated a small population of 360 specimens. 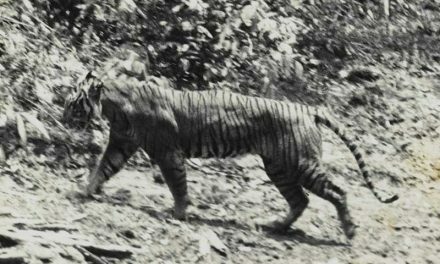 Panthera tigris altaica main risks are habitat loss and poaching with the intention to supply the black market with body parts to use them for medical purposes. On the other hand, poaching of other animal species reduces food sources, which put them into conflict with humans when they attack domestic livestock. This tiger is included in Appendix I of CITES, in the same group of Animals that are in great danger. Also, the Siberian Tiger Project launched in 1992, based its operation on studies and data collections, and the creation of a conservation plan. In 2010, the governments of Russia and China signed an agreement to improve the conservation of protected areas in the transboundary region. There are very few accounts Siberian Tigers attacking humans. 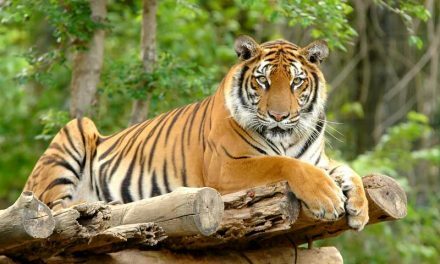 In 2007 one did escape from a zoo in California and kill a person that had been harassing the tiger throughout the day. 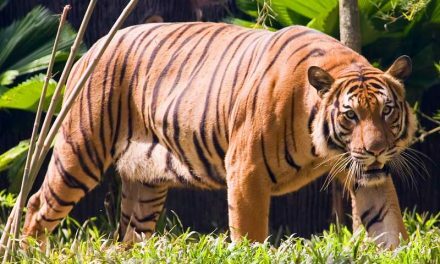 This event got a lot of media attention and gave the impression that these particular Tigers seek out feeding upon humans, but that isn’t true at all. World of animals. Book of Predators. Imagine Publishing Ltd. 2014. P. 70. 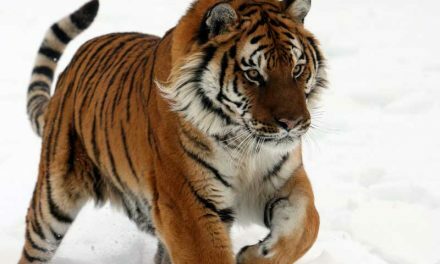 The Great Soul of Siberia: In Search of the Elusive Siberian Tiger. Sooyong Park. HarperCollins UK, 2016.